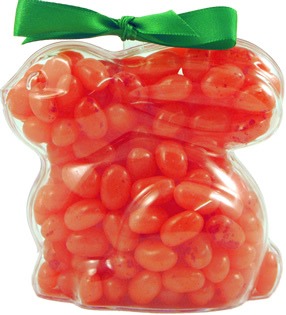 Tangerine Gourmet Jelly Beans - delicious tangerine flavour juicy jelly beans from The Jelly Bean Factory. Not only do they taste fabulous but they are Gelatine Free. We sell them in 125 gram bags (that`s an old 1/4 pound plus an extra 10%) - so yo... More.. Strawberry Gourmet Jelly Beans - delicious strawberry flavour juicy jelly beans from The Jelly Bean Factory. Not only do they taste fabulous but they are Gelatine Free. We sell them in 125 gram bags (that`s an old 1/4 pound plus an extra 10%) - so y... More..
Mixed Gourmet Jelly Beans - An assortment of delicious beans that include some flavours we don`t sell individually yet. They are absolutely stunning, and with one bag of these, you can have your very own blind taste test. So many delicious flavour... More..
Assorted Gourmet Jelly Bean Bunny - Crouching - How about these brilliant Jelly Bean-filled Bunnies as a quirky alternative to chocolate Easter Eggs (yawn!). 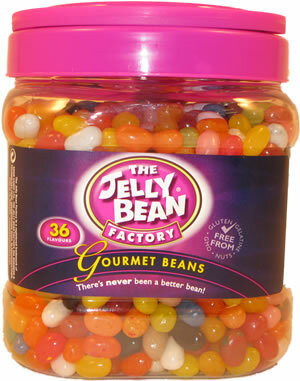 I mean, we LOVE chocolate Easter Eggs around here, but it`s nice to have a change from time... More..
Assorted Gourmet Jelly Beans `Bucket` - a huge great big tub of delicious fruit flavour juicy jelly beans from The Jelly Bean Factory. The variety of flavours includes several that we don`t sell individually yet - like Peachy Pie, Caribbean Coconut a... More.. Strawberry Smoothie Jelly Bean Bunny - Crouching - How about these brilliant Jelly Bean-filled Bunnies as a quirky alternative to Chocolate Easter Eggs (yawn, yawn...). I mean, we LOVE Chocolate Easter Eggs around here, but it`s nice to have a chang... More..
Blueberry Pie Gourmet Jelly Beans - delicious blueberry flavour juicy jelly beans from The Jelly Bean Factory. Not only do they taste fabulous but they are Gelatine Free. 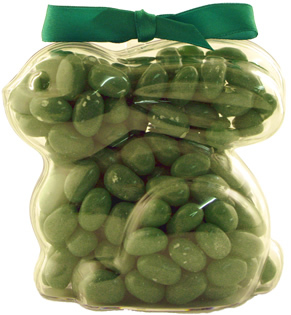 We sell them in 125 gram bags (that`s an old 1/4 pound plus an extra 10%) - s... More..
Apple Gourmet Jelly Bean Bunny - Crouching - How about these brilliant Jelly Bean-filled Bunnies as a quirky alternative to chocolate Easter Eggs (yawn!). I mean, we LOVE chocolate Easter Eggs around here, but it`s nice to have a change from time to... More..
Caribbean Coconut Gourmet Jelly Beans - delicious coconut flavour juicy jelly beans from The Jelly Bean Factory. Not only do they taste fabulous but they are Gelatine Free. 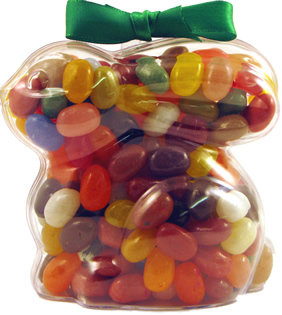 We sell them in 125 gram bags (that`s an old 1/4 pound plus an extra 10%) -... More..
Apple Gourmet Jelly Bean Bunny - Upright - A cheeky flopsy bunny filled to the brim with deliciously juicy Granny Smith Apple Gourmet Jelly Beans... a fantastically original alternative to Chocolate Easter Eggs. One of these beauties will last ages,... More..